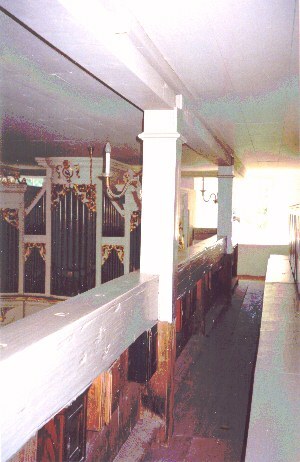 A Typical Silbermann small village church organ. 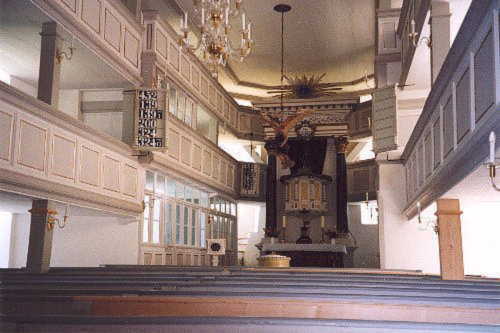 There is little record of the organ in Nassau village church prior to 1745, save that it was "a very bad organ, with many pipes stolen, practically ruined". Thus the congregation determined to provide their church with a new organ of two manuals and pedal, 19 stops, built by Gottfried Silbermann of nearby Freiberg, this being a "standard" Silbermann village organ specification. It was indeed Silbermann's policy to standardize as much as possible, thus reducing costs which allowed him to provide the very best materials and workmanship, for which he became renowned. A contract was signed in 1745 in which the Nassau congregation committed themselves to an expense of 800 Taler, with 200 Taler in the church funds and little idea as to where they would find the rest. There was worse to come. Prussia invaded Saxony in what would be known as the Second Silesian War. The region found itself bearing the burden of some 2,000 Prussian soldiers, all of whom expected to be quartered and fed by the occupied inhabitants, incurring a final debt to the region estimated at some 3,000 Talers. Work began on the organ in the middle of April 1748, with completion and testing on August 4th of that same year. Precisely how the impoverished congregation was able to meet the payment is not recorded, save that the Over-Consistory in Dresden apparently came to the rescue. Even then the congregation's troubles were not over, for it is recorded that just a month after its completion, the organ was damaged "by a wicked hand" – or as we might call it today, vandalism. This was quickly and satisfactorily repaired. 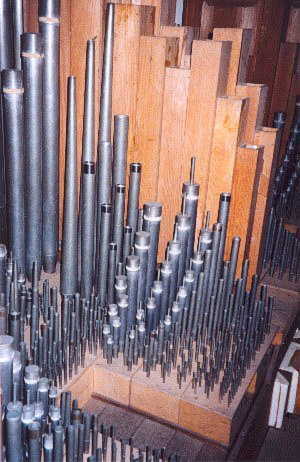 Little – fortunately – was done to the organ over the years, apart from routine maintenance and tuning. In 1917 the congregation was called upon to sacrifice the organ pipes, as the tin was required for the war effort. However to save their precious instrument, they managed to collect enough scrap tin to satisfy the authorities. In the 1920s the church was provided with electric light, and the organ with an electric pump – the original hand-pumping mechanism remains intact. It cannot go unsaid however, that during the latter years of the socialist, East German DDR regime, churches and their contents were subjected to rampant neglect and decay, being almost totally deprived of funding. Many of the church roofs were in a shocking state, to which the wooden ceilings inside bore witness with huge stains from water leakage. Naturally this affected the contents including the organs. 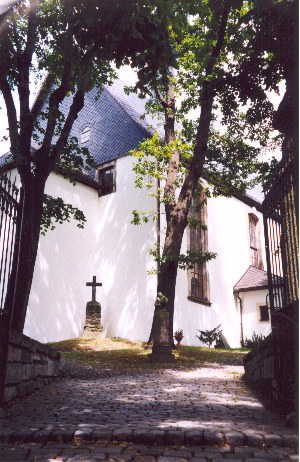 With the "fall of the wall" in 1990 a massive program of restoration took place throughout the former East Germany, of which the churches were major beneficiaries. The little church in Nassau stands today beautifully restored, its interior and exterior cleaned and painted, the building structure sound and renewed as necessary. 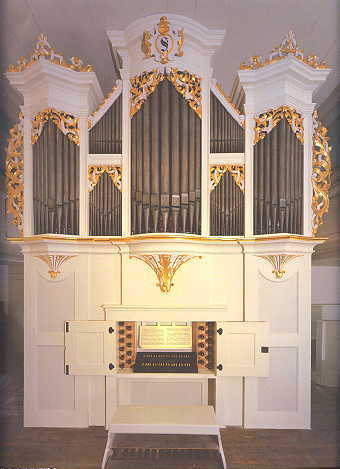 From January to June 1998, the 250th anniversary year of the organ's installation, a complete restoration was undertaken by the Dresden firm of Jehmlich Orgelbau, an old established company with long experience of and involvement in Silbermann's instruments. 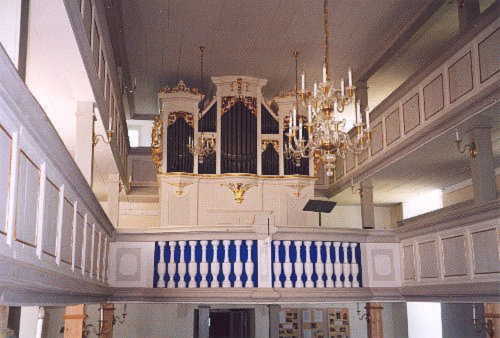 Thus the organ can be seen and heard today much as it would have sounded and appeared when Gottfried Silbermann and his team completed the work in 1748.
home to the Silbermann Organ Museum. 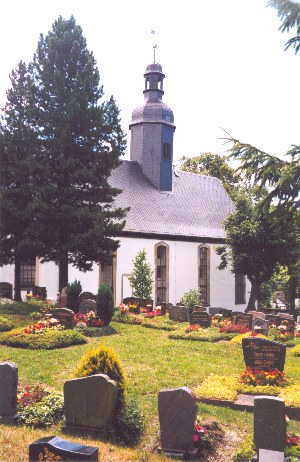 The town's website is available in German and English. CD featuring this organ, with illustration, full details and music samples.